Baby teeth may be small, but they're important. 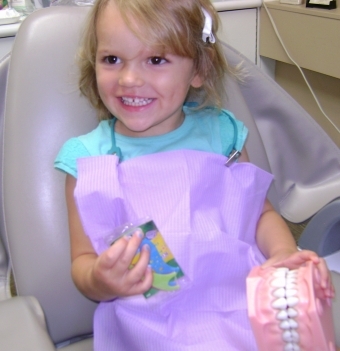 Without a healthy set of baby teeth, your child may have trouble chewing and speaking clearly. That's why caring for baby teeth and keeping them healthy is so important. This will wash off bacteria and prevent them from clinging to gums. Bacteria can leave behind plaque that can damage infant teeth as they come in. When baby teeth start to grow in, you can start using a toothbrush. Choose a soft brush, a small head, and a large handle. At first, just wet the toothbrush. As soon as teeth erupt, you can start using a bit of toothpaste without fluoride about the size of a grain of rice. You can increase this to a pea sized amount of fluoride toothpaste when your child has learned to spit. Brush gently but firmly all around your child's baby teeth. You should brush your baby's teeth until he or she is old enough to hold the brush. Continue to help them until they are able to brush without assistance. That usually happens at about age 6. Even after age 6, you should supervise your child when brushing and flossing, to make sure he or she is doing a good job. Brushing before bedtime is very important, so that cavity-causing bacteria don't have all night to cause cavities. Keep on the lookout for any signs of baby tooth decay which presents itself as brown or white spots on the teeth. Even if there isn't a problem, it is recommended that you take your child for his or her first dental visit by age 1 or 2. Get in touch with Lorne Park Dental any time to learn more about your baby's dental health.